Home > Membership > Nonprofit World > Nonprofit Compensation: To Pay or Not to Pay? 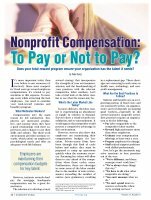 Nonprofit Compensation: To Pay or Not to Pay? Does your total-reward program ensure your organization has the talent it needs?